Celebrating 20 Years of Quilting Bliss! I had a realization a while back - I made my first quilt in 1993. That's 20 years ago! That got me thinking that I need to do something to celebrate. In the past 20 years, I've made countless quilts (literally! ), learned many techniques, joined a few guilds, made tons of great friends, wrote 4 books, contributed to several books and magazines, hosted and online quilt-along and edited 20+ books for others and guess what? I'm just getting started! Wanna see my first bed quilt? Brace yourself! My first quilt - ugly, but well-loved! I made it for my then-3-year-old son when he moved from the crib to the big bed! It's been on his bed ever since. This is my most recent quilt (applique of course!). This is all I can show you for now, but just wait until September! I'll show you more then. So to celebrate two decades of quilting, I thought I'd share with you what I've learned over the last 20 years. Starting today I'm going to share with you all my tips and hints about quilting. They will be practical, philosophical and some will be just plain silly! Some you will have already heard before and some, I hope, will be new-to-you. 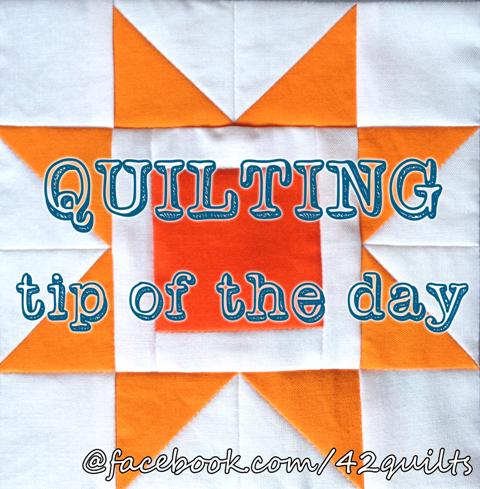 I will post the tip of the day on my Facebook page: www.facebook.com/42quilts. Be sure to hit "like" on the 42 Quilts page if you haven't already so you don't miss any! If you don't do Facebook, I will do a tip round-up every so often here for you. And just so you know, I probably won't post a tip each day, but I will post several a week. I don't think I could handle the pressure of posting a tip daily! Join me on Facebook for a quilting tip of the day! Please join me as I share with you what I know about quilting! And as always please post your comments. I love hearing what you have to say! Congratulations on 20 years! Can't wait to see what you quilt up in the next 20! I'm curious about that too! Thanks! congrats! I started in 1998, and I haven't finished that quilt yet! but I really got going in quilting in 2007, after my first son was born. I started quilting in earnest after the kids came too! I need something that stayed put and did what I told it to do! Congrats on 20 years..that is simple wonderful.. My grandmother taught me to quilt when I was a young girl. And know as a young women (36) I love to quilt. I have also taught my daughter to quilt. Im hoping that one day she will grow to love it as I do. One of my favorite combinations is black, gray, red and white.